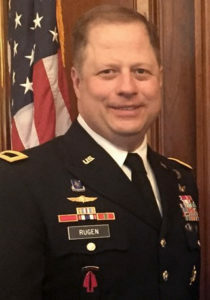 BG Walter Rugen is Deputy Division Commander – 7th Infantry Division and Director, Future Vertical Lift, He is a respected senior executive and veteran with a distinguished 29-year career leading US Army and Special Operations Aviation units. He has extensive expertise in planning, programming and budget execution at the strategic level; managing an obligation authority in excess of $120 billion over 5 years. He also has significant planning experience at the national strategic level. He has experienced repeated success guiding large organizations in modernization, transformation, aviation safety, aviation maintenance, and efficiency improvements in international settings. In Memoriam – Robert D. Powell, Jr.
Robert D. Powell, Jr. (Bob) passed away August 6, 2018 at the age of 95. He was an American Helicopter Society 66-year Emeritus Member and a member of the President’s Club. He is credited with sponsoring over 400 new AHS members. He served many years as the Hampton Roads Chapter Treasurer and as the administrator for the annual Chapter-sponsored international technical meetings. He was primarily responsible for managing the chapter’s financial resources in a way that allowed the chapter to award college scholarships, support local science fairs and contribute to museums that have a substantial interest in educating the public about the history of rotorcraft and its role in civil and military applications. Bob was a graduate of the University of Virginia, and a US Navy aviator. Bob flew the F8F Bearcat on active duty and the F4U Corsair and F7F Tiger Cat with the Naval Air Reserves at Norfolk. He earned wings of the National Advisory Committee on Aeronautics (NACA) for his service at Langley Field in Hampton. At Langley he was primarily involved in testing helicopter rotors on the Langley hover stand. Shortly after NACA transitioned to the National Air and Space Administration (NASA) Bob, with several other helicopter engineers, transferred to the US Army Transportation Research Command (TRECOM), a forerunner of the Research, Development and Engineering Command (RDECOM) component still located at Fort Eustis, Virginia. There Bob continued to work as project engineer for helicopter research programs including Heavy Lift Helicopter, Integrated Technology Rotor and AH-1 rotor blade replacement programs, to mention just a few. After he retired from US Army civil service, he was employed for several years by Kaman Aerospace Corporation as their regional representative. Bob was predeceased by his wife of 46 years, Susan Hawley Powell, who died in 2017, and his daughter, Martha P. Lovett, who died in 2018. He is survived by two daughters, N. Peyton Powell and M. Lindsay Powell; five grandchildren, six great grandchildren, and four great-great grandchildren. Funeral arrangements are being provided by Amory Funeral Home. The funeral will be held at Grace Episcopal Church in Yorktown on October 13 at a time to be announced. Author rjohnson@vtol.orgPosted on August 10, 2018 September 13, 2018 Categories MembersLeave a comment on In Memoriam – Robert D. Powell, Jr.